Paranal, zodiacal light and Milky Way, � St�phane Guisard, "Los Cielos de Chile"
Description Milky Way is crossing Paranal sky and meeting with Zodiacal light to the West behind Paranal Observatory on the all-sky Virtual Reality animation above. Three of the most emblematic constellations are visible on the horizon : Orion (West), Big deeper (North) and Scorpius (East). The Large and Small magellanic clouds are visible to the South together with Southern Cross, Eta Carina nebula and Coal sack. Command Click on symbols (GO FULLSCREEN BY CLICKING the arrowed 'X' on animation) or use arrow Keys or click & drag mouse to move Left/Right/Up/Down, Shift/Ctrl Keys or mouse wheel to zoom In/Out ....... have a nice trip !! ..... Don' want to see the constellation lines ? Normal version without constellations names and figures here. All sky fisheye view. Same picture without constellation lines and names here. 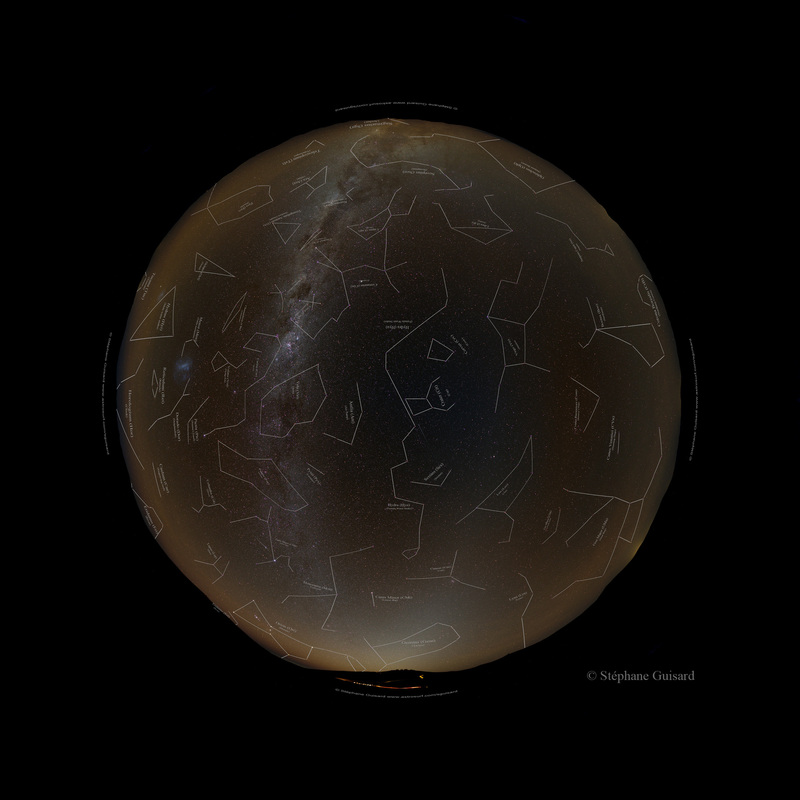 360 degrees horizon view with Paranal Observatory, Orion, Big deeper, Scorpius, Milky Way and zodiacal light. Same picture without constellation lines and names here. 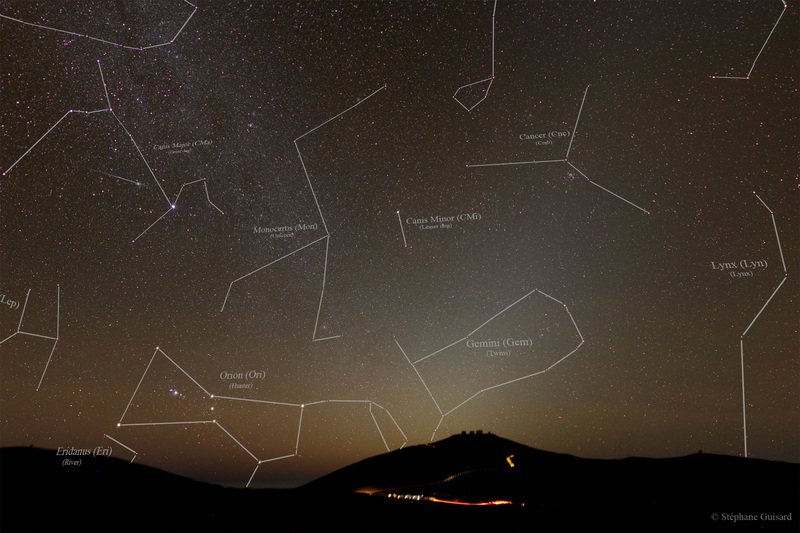 West view with Paranal Observatory, Orion, Milky Way and zodiacal light. Same picture without constellation lines and names here. 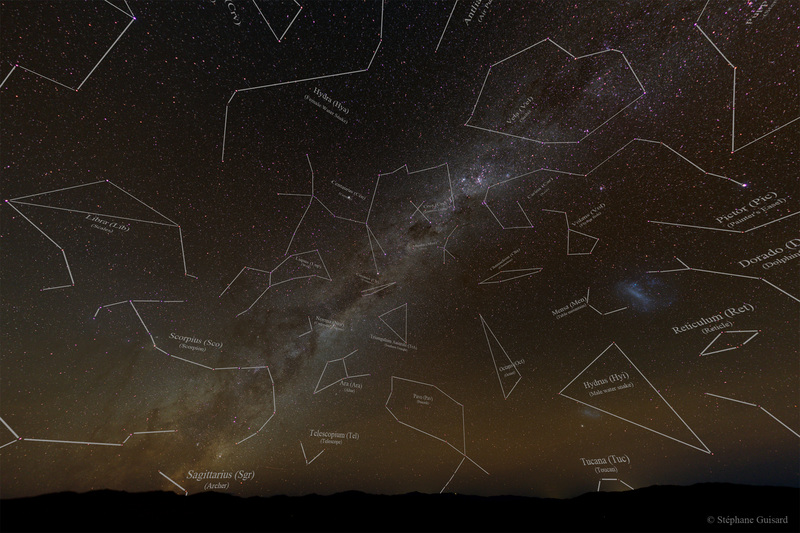 South-East view with Milky Way, Scorpius constellation, Southern Cross and Magellanic clouds. Same picture without constellation lines and names here.